This definitively shows his involvement with this scandal. Mueller needs to resign because if Trump were to fire him, it makes Trump look like hes obstructing justice. Mueller’s close friendship with James Comey is the main reason for him to step down, but also the man is traitor in my opinion. Then as this investigation progress and Mueller’s team could not find any evidence of Russian collusion, the team has now decided to investigate Trumps business as far back as ten years ago. I call this BULL CRAP! What does his business have to do with what he was appointed for? The whole Russian collusion thing is nothing but a conspiracy theory made up so the Democrats can have a giant “witch hunt” and it keeps the limelight off their own corrupt candidate who belongs behind bars, Hillary Clinton. Will Mueller step down? I seriously doubt it and this witch hunt will continue through the Trump presidency I am afraid. A 60 square foot room and a bathroom, for five years with no ending in the future. You have to live here with no access to the outside. Others have to provide your basic needs such as toiletries, food etc. Visitors are few and far between. You cannot see your family because it would put them in danger by being there. You have children growing up without you. No sunshine, no real exercise. After awhile, the depression sets in and the isolation begins to change you permanently. Because there are people watching you 24/7, the paranoia begins to set in. People have betrayed you and lied to you. Now, stop and think, you did nothing to put yourself in this position but expose criminal behavior. Now, I want you to imagine a man who uncovered some of the world’s worst corruption. He then exposed it. He published the truth. He knew there might be consequences but he did it anyway. The governments he exposed call him a spy, a traitor, but never deny his accusations because they are true. This government wants to extradite you and try you, but there are no international charges against you. They set you up and accuse you of something you didn’t do. So, you seek political asylum. By doing this, you find yourself stuck in this room we spoke earlier about. Even after the allegations for the crime you didn’t commit are dropped, the government of the country who originally arrested you says they intend to arrest you anyway. Extradition could mean torture or worse yet death. You gave up your freedom so other’s could be free…. How would you feel? Would you continue your work exposing the truth? Julian Assange has at the expense of his own freedom and life. Is there any way we can help him? He’s been fighting legally for his freedom for all this time. Imagine the legal fees he’s encountered. Yes we can help this man. First by writing letters to those involved from the President of the United States to the government of the UK. Spreading the word on social media. The biggest way to help though is to simply donate at http://www.wikileaks.org or go to justice4assange.com Even 5 dollars would help in his fight for freedom. Do it today. CIA Director Pompeo is far from the best choice to lead the CIA and it’s mission unless you like keeping it corrupt and spying on you. The man who once supported Wikileaks and it’s information flipped over and now says it is a dangerous intelligent agency. How can we trust someone with this background? Pompeo has supported online surveillance programs. He has said former NSA contractor Edward Snowden should be “brought back from Russia and given due process.” He stated, “I think the proper outcome would be that he would be given a death sentence” because he “put friends of mine, friends of yours who serve in the military today at enormous risk because of the information he stole and then released to foreign powers. I am not sure of the real reason President Trump picks this man who blatantly has some issues. Going after whistleblowers and leakers is definitely showing ties to Deep State and shows that this man cannot be trusted as he would hide corruption from the citizens of the United States. WikiLeaks walks like a hostile intelligence service and talks like a hostile intelligence service. It has encouraged its followers to find jobs at CIA in order to obtain intelligence. It directed Chelsea Manning in her theft of specific secret information. And it overwhelmingly focuses on the United States, while seeking support from anti-democratic countries and organizations. It is time to call out WikiLeaks for what it really is – a non-state hostile intelligence service often abetted by state actors like Russia. He is wrong in his opinions. The only reason he could possibly have went from loving Wikileaks to hating them is his current position. He wants to make a name for himself regardless of the truth. He is fighting against the truth which is what the CIA seems to endorse. Wikileaks has the same goals as any news organization. They want to publish the truth, (though many of those organizations would rather lie in these troubled times and are bias), Julian Assange and Wikileaks has always only published the unbiased honest facts. They have never had to retract a story and do not want to bring down America in any way. We The People have a right to a transparent government and Assange has made that possible. Once again the high hilarity of the deceitful surfaces in Pompeo’s calling Assange a threat to democracy. Once again, it is obvious how quickly people turn on the truth and choose deception and lies. Pompeo has called torturers patriotic or his open support of such places as Guatanamo open which is defined often as a place of torture. So then as a director of the CIA, Mike Pompeo will not be constitutionally fit for office nor will he be for the rights of the people. He will seek to destroy organizations such as Wikileaks and seek the death penalty in all whistleblower cases. In fact because of the NDAA act of 2011, he could detain Julian Assange or Edward Snowden indefinitely. What chaos will this man cause in our country while he is director? Do we as a country need this in light of all the other problems we have? Why Won’t Twitter Verify Assange and rid itself of Assange impersonators? Many of us have been asking this for awhile now. According to Julian, Wikileaks has been trying to get him verified since last October. Twitter in many ways has more or less admitted @JulianAssange is the real one and yet they won’t verify him. Why? Does it have to do with their liberal bias? Why are they not nipping the impersonators in the bud and ridding themselves of the vermin who seek to make a joke of Wikileaks and Assange? If they do not verify Julian, it limits the number of people who follow him which also limits his message. It contains anything he shares to a small audience. People question is authenticity as well. This means Twitter is basically violating his rights to free speech and our rights to free press as well as censoring content. Many Twitter accounts that are basically Conservative are also finding they are being censored.Julian is neither Conservative or Liberal, Republican or Democrat and yet they continue to censor his material by not verifying him. The other issue is that impostors are spreading fake news and pretending they are him on the President’s account, other government officials, and to the media. Their are accounts are exact duplicates of his and often have names just similar enough to trick the quick reader. This takes away from the message Julian intends to send by making him look like a liar. This is not right and cannot be accepted by those who support him. We must insist upon the verification of Mr. Assange so that his message isn’t taken lightly or censored. We must stand up and fight for what is right! Everyone you talk to knows the name Julian Assange or Wikileaks but have you heard the story of Barrett Brown? Barrett is a journalist from the United States who founded Project PM, which is a crowd sourced investigation into the cyber industrial complex. He also writes a column for the Intercept even while he was incarcerated. Brown was jailed for charges related to the 2011 Stratfor Attack. His case has been so underreported that in fact little to nothing is known by the general public in his defense. Barrett was known for having ties to Anonymous and writing about Anonymous’s potential and activities. Brown’s case is a good reminder of the considerable risk faced by reporters who report on leaks. Barrett was incarcerated from 2012 until his release in November of 2016 . He is now required to pay the hefty sum of 900,000 dollars to the US government. He was taken back into custody in April of 2017 and held on unknown charges for four days. When released he was held on house arrest. Despite pressure from the government to not give any interviews, he gave one to Democracy Now. In 2017, lawyers for donors to Brown’s legal fund filed suit against Assistant United States Attorney Candina Heath for filing a subpoena against WePay that resulted in divulgence of their identities. The lawyers argued that the irrelevance of donor information to the case against Brown and the provision of the information directly to Special Agent Robert Smith of the Federal Bureau of Investigation rather than to the prosecutor or judge in the trial led to donors’ belief that the information was intended to surveil and harass the donors for activity protected by the U.S. constitution, and filed for destruction of the data and monetary damages. What Crimes Did Julian Assange Commit? From what I have seen and read, I have put together a list of his crimes. The real crime he committed simply put is that he showed the corruption in our government and those exposed didn’t like their secrets coming up. Especially those who had a lot to hide. So the best thing for these individuals and organizations to do was “Point a finger” at Julian Assange and Wikileaks and scream, “Spy” , “Russian Operative” and “Treason”. The problem with hollering treason is that Julian is not a US Citizen. Treason is defined in the dictionary as the crime of betraying one’s country, especially by attempting to kill the sovereign or overthrow the government. So, publishing leaks cannot be seen as treasonous. Russian Operative is my favorite. That’s all we have heard about since Trump was elected President. Russia this and Russia that until they are blue in the face and throwing fits. The problem with this is that it is simply untrue. If Julian was in Russia right now, he’d probably be facing charges there for some unknown reason. Spy. Yes Julian has the looks and the dress to be a 007. In fact, I think if he was an actor he would be a good choice for the next movie but that’s about as far as it goes. To be a spy he would have had to obtain the information from the governments himself, instead he receives it from whistleblowers and leakers. So, the only real crime Julian is guilty of is having a heart and wanting people to know the truth about their evil governments. He wants to be free again. I guess that is a crime in these troubled times. May more people be guilty of being compassionate and caring about the underdog. I would like to call to attention the First Amendment of the Constitution of the United States that clearly states Congress shall make no law respecting an establishment of religion, or prohibiting the free exercise thereof; or abridging the freedom of speech, or of the press; or the right of the people peaceably to assemble, and to petition the Government for a redress of grievances. According to this amendment, the recent investigation into Wikileaks and it’s founder Julian Assange is a violation of this amendment. Wikileaks is a publisher and a media outlet and by investigating them to charge them under the Espionage Act is a violation of our citizens rights as individuals as the First Amendment clearly states we have a right to free press. In light of this violation, I request that you immediately drop any charges or allegations against the organization and Mr. Assange or issue him a preemptive pardon as he has only brought to light the evil done against the Citizens of the United States. If we begin to prosecute our journalists and the press for publishing whistleblower documents, we are no longer a Republic governed by the people but are bordering on becoming tyrannical and becoming a Socialist state. Violating the First Amendment is only the beginning of an overthrow of the people’s government. In fact, if you continue to violate this right for free press and continue your investigation into Wikileaks, you must also look into the prosecution of the New York Times, the Washington Post and various other media outlets who have openly published leaks from the government. Please do what is right for the Citizens and the individuals involved in this case, and pardon Wikileaks and Julian Assange of any wrongdoing and cease and desist to seek charges. Pompeo’s comments immediately drew attention to a tweet from July 2016 in which he linked to the WikiLeaks document dump of emails from the Democratic National Committee. Critics used the tweet to call out Pompeo for his dramatic reversal on WikiLeaks. Pompeo, however, repeatedly cited the group to attack Hillary Clinton during the campaign, a CNN KFile review of his tweets and media appearances shows. Pompeo even said that the release of information to Wikileaks by Russia was nonsense and stuck up for them. He has however turned full circle which makes me believe that the recent release of Vault 7 on the CIA has influenced him as well as the Deep State. His recent quote shows how he has betrayed his own words. My own comment on this revelation on Julian Assange’s twitter feed is truth as I said, “For an organization like Wikileaks to take down the strongest government in the world the staff must be super human.” I have never believed that Julian and his staff ever wanted to destroy America or “take it down”. Instead, I think their mission and goal has always been to expose corruption and the lies told to us by our own governments. The reason it appears that he targets America is because the US government has more to hide than other country in the world, and so, because of this, there is more to leak.Also, leaks from countries like China or Russia get leakers killed. Most whistleblowers would never even get the information out of the country, let alone to Wikileaks. Pompeo has also referred to Wikileaks as a hostile intelligence service, but in June 2016 during the campaign, when Pompeo was a Republican House lawmaker from Kansas, he tweeted a link to hacked documents obtained by WikiLeaks of emails from the Democratic National Committee. So does that make him an accessory to this hostile organization? It truly amazes me how fast these officials can turn tail in the face of their adversaries and cover their own butts. Julian Assange and Wikileaks have done nothing but exercise their right to free press and shown the world the evils of a government that has grown too big for it’s own britches. If it were not for the email releases on the DNC and John Podesta, America would be in the clutches of one of the worst criminals in political history, Hillary Clinton. 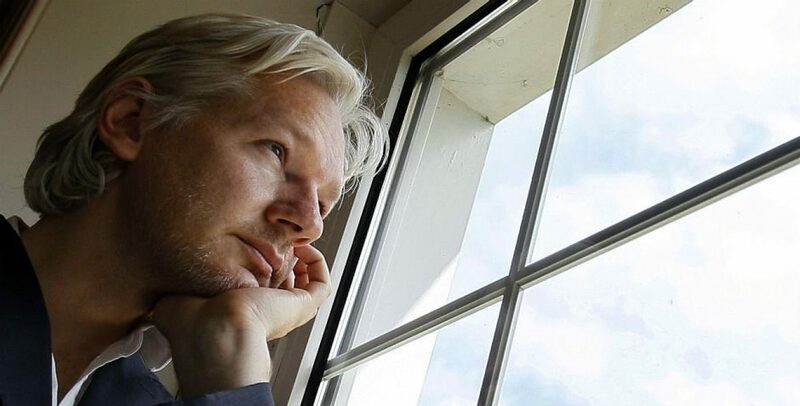 Rather than being a hostile informant, a cyber terrorist or any of the other incriminating titles the media and others have used to describe Assange, I deem a hero. Not many men would risk their lives for even a friend, but he has put his life on the line for those who he does not know and even for those who hate him. Enemy? I think not, more like courageous, daring, gallant and fearless. Perhaps a better title would be Information Warrior. He is literally a symbol of truth and justice and for that we should thank him. Here is a simple question for you to answer, though I almost dread what you will say if you believe in socialism. A man down the road is in a wheel chair and needs his lawn mowed because he can’t do it himself. Under socialism, your son is required by law to mow her lawn but doesn’t do it one week. Because he is required by the government to do so, he has committed a crime and therefore must go to jail and serve a sentence without trial which is given to him of six months of hard labor. Is this right? Is it right to redistribute wealth even to those not willing to work for it, give others what people have earned by working hard, and enforce with hard jail time? Would it be better if your son was forced to give the man 40 dollars a week of his earnings because of socialism which the man could either use to get his lawn mowed or instead buy himself beer or drugs? What socialism does is forces one individual to forcibly be used to serve another. Regardless of how you view it, socialism takes away the rights of the individual. Now, let’s give another example of what socialism is. Obamacare. ACA forces us to purchase insurance whether we need it or not so that other individuals who do not have the means can obtain it without money. By putting into effect a law that burdens the taxpayer with a fee if insurance is not paid for, it forcibly makes individuals pay for something for someone else who did not earn it. Isn’t that the same thing as theft? I am certainly not against helping those who are in poverty as it says in the Bible we are to take care of our poor. What I am against is the government having the control of how we use our money. Charity should be given, not forced. We need to take care of our poor by donations and through organizations that use the money sensibly. Millenials and advocates for Socialism often point to Denmark as an example but even the leader of that country says it is not a socialist governing body. Prime Minister Lars Rasmussen was quoted as saying, “I would like to make one thing clear: Denmark is far from a socialist planned economy; Denmark is a market economy.” So, in essence, socialists cannot use this as an example of successful socialism. Senator Bernie Sanders has pushed under his socialist ideas that college should be free. However, those who choose a skilled trade or start a business from scratch without college should not be made to pay for a college degree for someone else who may drop out or not even use that degree. That is also taking away the rights of the individual. In fact, the very concept of how to achieve Socialism is against the Constitution itself by taking away basic rights of the individual and giving those rights to the government as outlined in Alinsky’s 8 steps. Poverty — Increase the Poverty level as high as possible, poor people are easier to control and will not fight back if you are providing everything for them to live. Debt — Increase the debt to an unsustainable level. That way you are able to increase taxes, and this will produce more poverty. Education — Take control of what people read and listen to us“ take control of what children learn in school. Religion — Remove the belief in the God from the Government and schools. Class Warfare — Divide the people into the wealthy and the poor. This will cause more discontent and it will be easier to take (Tax) the wealthy with the support of the poor. The United States Educational System has already implemented the idea of socialism into our children by taking away pride in our country and indoctrinating our children. This must be stopped. The liberals have also attempted to remove any form of religion from our education and have replaced it with the push for more government control. So part of this 8 step program is already being implemented into society. ACA and any act to repeal and replace is also a step into socialism. Our government should not have the right to choose our healthcare for us, or force us through taxes to supply it to someone else. Once socialism implemented by using the image of taking care of everyone, and making everyone equal. However, not everyone is alike and not everyone has the same needs. Also, as an example, take a look at the case of #CharlieGard. Suddenly, the government has the right to decide if someone is an asset to society based on their health and how much it costs to keep them alive. Soon, the mentally ill, the elderly and the handicap will be euthanized by a socialist government that no longer has a use for them. Is that right? Looking back at countries like Germany, the USSR and Cuba, you can see that to implement these forms of government they literally murdered millions. To implement a government that removes the rights of individuals, the government finds that genocide is the only way to remove the opposition. This is why socialism is not only wrong but downright evil. Can we as free countrymen of the United States of America under the Constitution give up our rights and allow this to happen? We must not for ourselves and for the generations that follow! Look at the neighbor kids are your block or the average class at an elementary school which is approximately 30 children. Now, look into their eyes and realize that those kids are no different than the innocent children in Yemen who are dying from this disease. Worse yet, imagine one of those youngsters to be one of your own. Now picture this child normally would have had medical aid available if it wasn’t for the war. Fair? No, not at all. Less than 45% of Yemen medical facilities are even operational, let alone fully functioning. This means other diseases will soon follow. “Further deaths can be prevented, but warring parties must ease restrictions and allow the import of medicines, food and essential supplies and they must show restraint in the way they conduct warfare,” said Mr Maurer. How can we help? Follow this link and donate to this humanitarian cause. If you cannot donate, spread the word so others can!